Due to extensive decay, this Red Oak is slated for removal Aug. 13-14, weather permitting. A large Red Oak tree near the main entrance to Emory's campus is set for removal Aug. 13-14 due to extensive decay. 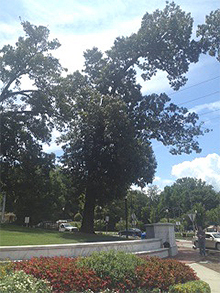 The tree is located on the Glenn Memorial Church lawn behind the Haygood/Hopkins entrance to the university on Dowman Drive. The Red Oak was recently inspected by certified arborists with Arborguard Tree Specialists, who found that the upper main trunk has large amounts of decay which will continue to progress to a point where the tree will be structurally weakened, resulting in a high probability of failure during high winds or storms. The tree must be removed to protect pedestrians and motorists on Dowman Drive and North Decatur Road. An equivalent number of replacement trees will be planted during the winter in accordance with Emory's No Net Loss of Forest Canopy policy. The tree is a Southern Red Oak with a diameter of 39 inches, which will require the planting of 23 native canopy trees with a diameter of 2 to 2.5 inches. Questions and comments are welcomed and can be directed to Jimmy Powell, director of Exterior Services, at jimmy.powell@emory.edu.